Big Red's legal team must've been asleep (or Facebooking) at the wheel for missing the not-so-hidden message of their new marketing campaign. 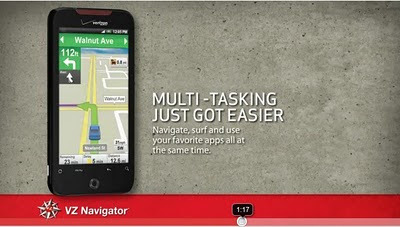 In a promotional video published a few days ago, Verizon touts the multitasking capabilities of their new VZ Navigation GPS app by encouraging their customers to surf the web and Facebook while driving. "Navigate, surf and use your favorite apps all at the same time," says Verizon. 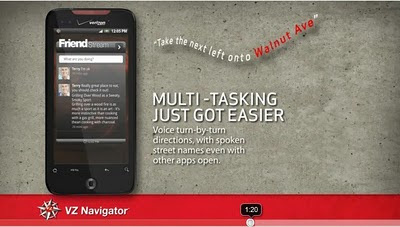 In the screenshot below, Verizon illustrates the phone providing turn-by-turn directions while the driver is using Friendstream, an app that gives you access to your Facebook and Twitter friends. With thirty states and the District of Columbia having Distracted Driving laws on the books that make texting illegal while driving, Verizon's recent video is the height of irresponsibility - actually encouraging drivers to focus their attention on not just one, but multiple other things on their phones while driving. Ridiculous.